(Newser) – Reading ancient battlefields is no easy task given they so often leave no trace behind—wood disintegrates, iron rusts, and stones aren't detectable. But lead is different, and a cache of hundreds of ancient sling bullets was readily detected thanks to specialized metal detectors in Burnswark Hill in southern Scotland. Their discovery tells the story of what may be among the first battles of the Roman invasion of Scotland (then called Caledonia) around AD140, reports the BBC. It's a big break for battlefield archaeologists who have been trying for centuries to sort out the precise role Burnswark Hill played in Rome's attempted occupation of the area 1,800 years ago. And it seems the Romans staged a huge show of force to overtake an outnumbered enemy guarding a fort. Interesting. I once read that a Roman javelin had the same force and accuracy as the muskets used in the American Revolution, but these sling bullets probably exceeded that. 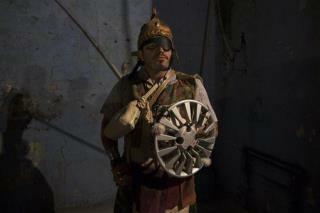 Has anyone else noticed the " Roman soldier" in the file photo has a automotive hubcap for a shield?